Director – Charles T. Barton, Screenplay – John Grant, Robert Lees & Frederic I. Rinaldo, Producer – Robert Arthur, Photography (b&w) – Charles Van Enger, Music – Frank Skinner, Orchestrations – David Tamkin, Special Photographic Effects – Jerome Ash & David S. Horsley, Makeup – Bud Westmore, Art Direction – Hilyard Brown & John Herzbrun. Production Company – Universal-International. Two bumbling baggage clerks, Wilbur and Chick, are asked to deliver a crate to a wax museum. Wilbur discovers that the crate contain the bodies of Dracula and the Frankenstein monster. In their bumbling, the two of them succeed in freeing Dracula. Dracula revives the Frankenstein monster, intending to use it as his servant. Dracula then enlists the help of scientist Sandra Mornay to transplant Wilbur’s brain into the monster’s head in order to make it more docile. 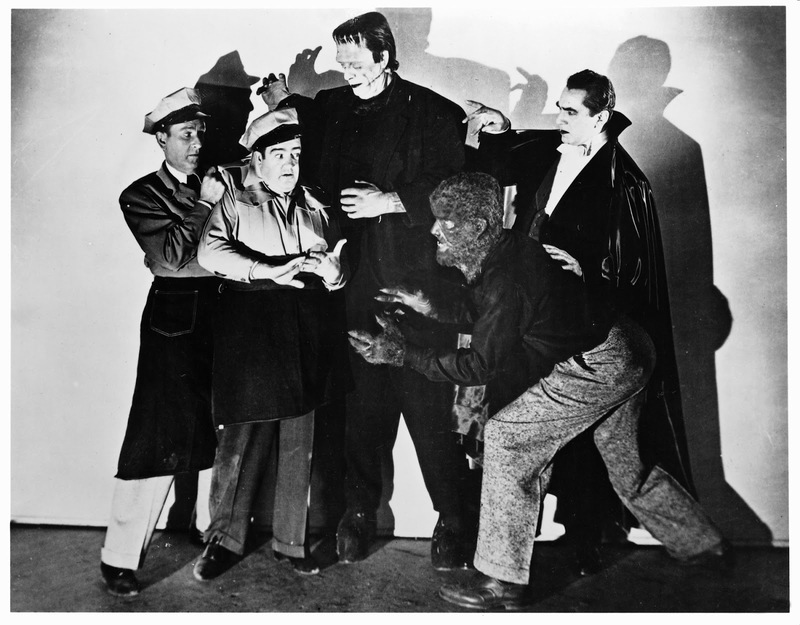 Abbott and Costello Meet Frankenstein – or to give it the title that appears on the credits Bud Abbott Lou Costello Meet Frankenstein – was the first of Abbott and Costello’s team-ups with the famous Universal monsters. It came at a point where Universal had fairly much creatively exhausted the services of both Abbott and Costello and its monsters. Abbott and Costello had steadily made an average of three (sometimes six) films a year together since 1941 and were starting to run out of originality. At the same time, Universal had exhausted most of the possibilities from both of its Frankenstein and Dracula film series, having spent most of the decade shuffling them around in a series of team-ups with one another beginning with Frankenstein Meets the Wolf Man (1943). 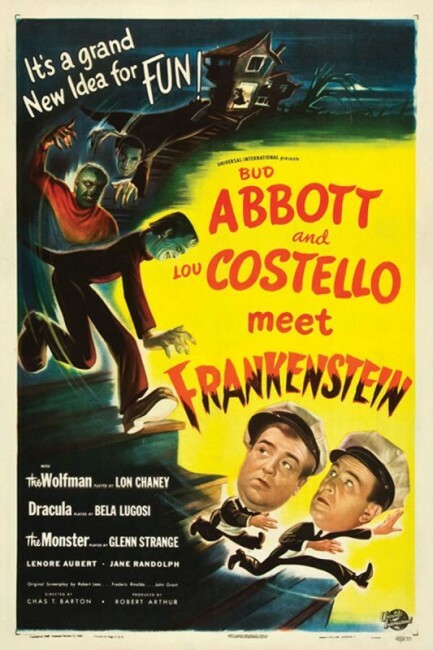 The decision on Universal’s part to combine both Abbott and Costello and its monsters’ careers was a brainstorm that falls somewhere between ingenuity and creative desperation. The Abbott and Costello team-ups are generally spoken of as the nadir of the famous monsters’ careers but in truth this was something that had happened in at least the mid 1940s in efforts like The Ghost of Frankenstein (1942) and Son of Dracula (1943). Abbott and Costello Meet Frankenstein did not do much to restore the dignity of either Dracula, the Frankenstein monster or the Wolf Man, but it at least gave them the most engagingly likable (and the best budgeted) outing any of them had had in some time. Abbott and Costello Meet Frankenstein was certainly the best of the two clowns’ meetings with the monsters – the rest of the Abbott and Costello monster films fall back to their usual tiresome clownish pratfalls. The monsters in Abbott and Costello Meet Frankenstein are reduced to buffoonish characters, emptied of any threat they ever had. The film brings back Bela Lugosi as the Count, a role he had resisted repeating for the seventeen years following Dracula (1931), during which time his career had slid down into poverty row mad scientist parts). For all its billing as the top-lined monster, the Frankenstein monster is only a supporting player – Dracula is the main threat, concocting an improbable scheme to turn the Frankenstein monster into his personal slave using Lou’s brain. The Wolf Man, as is the case in most of the Universal monster bashes, is fairly much a hanger-on who runs around the periphery of the action like a lost puppy dog with nothing to do as a character. On the other hand, Abbott and Costello Meet Frankenstein has Abbott and Costello operating at their comic heights. The script outfits them with a number of snappy one-liners: “I’m a union man and I work sixteen hours a day,” “A union man only works eight hours,” “I belong to two unions.” Or the wolfman’s trying to explain his plight: “Every night when the moon is full I turn into a wolf,” “Yeah, you and about twenty million other guys.” There is a good deal of, if not exactly subtlety, then at least dexterity to the physical comedy running around the wax museum with the monsters popping out of their crates and coffins, and later around the lab. Of all Abbott and Costello’s films, monster bashes and otherwise, Abbott and Costello Meet Frankenstein is oddly the one that has become the most well remembered by the public at large and even attained a nostalgic fondness. There is some debate about what the films title is. 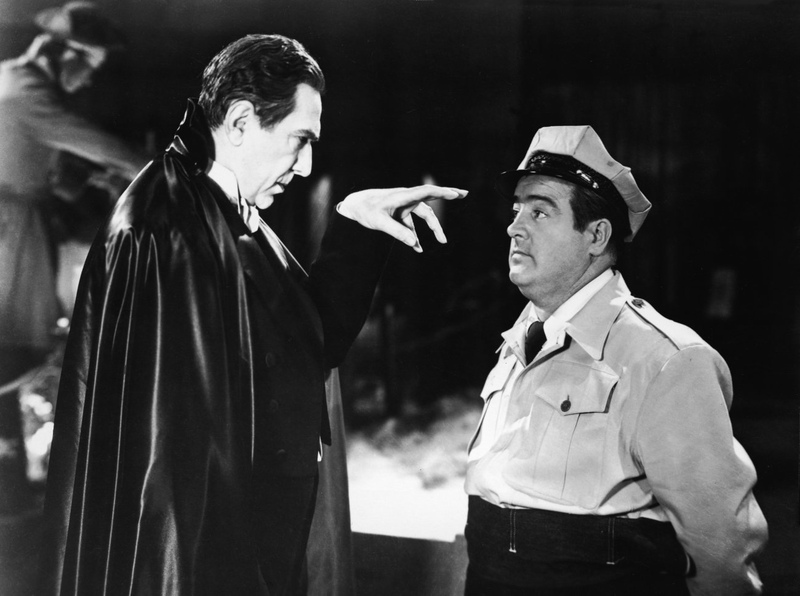 The majority of reviewers go with the most commonly used one Abbott and Costello Meet Frankenstein, although it should be noted that this never appears anywhere on the film. The credits and the poster give the title as Bud Abbott Lou Costello Meet Frankenstein. Some other film historians go with the dictum that the actors’ names should not be part of the title and shorten this to Meet Frankenstein. For the sake of avoiding general confusion and in the lack of any consensus, this site chooses to go with the common usage. The other Abbott and Costello monster bashes are:- Abbott and Costello Meet the Invisible Man (1951), Abbott and Costello Meet Dr Jekyll and Mr Hyde (1953) and Abbott and Costello Meet the Mummy (1955). Other Abbott and Costello genre outings include Hold That Ghost (1941), The Time of Their Lives (1946), Comin’ Round the Mountain (1951), Jack and the Beanstalk (1952) and Abbott and Costello Go to Mars (1953). Lou Costello mde one solo effort with The 30-Foot Bride of Candy Rock (1959). The other Universal Frankenstein films are:– Frankenstein (1931), Bride of Frankenstein (1935), Son of Frankenstein (1939), The Ghost of Frankenstein (1942), Frankenstein Meets the Wolf Man (1943) and House of Frankenstein (1944). The other Universal Dracula films are:– Dracula (1931), Dracula’s Daughter (1936), Son of Dracula (1943) and House of Dracula (1945). The Wolf Man’s only solo outing was The Wolf Man (1941).